Sword like leaves appear in early summer followed by the intricately beautiful fragrant flowers borne on 40cm stems. As a half hardy plant Ferraria is best grown in a pot. Flowers appear in spring and early summer after which the pot can be left to dry as bulbs become dormant. 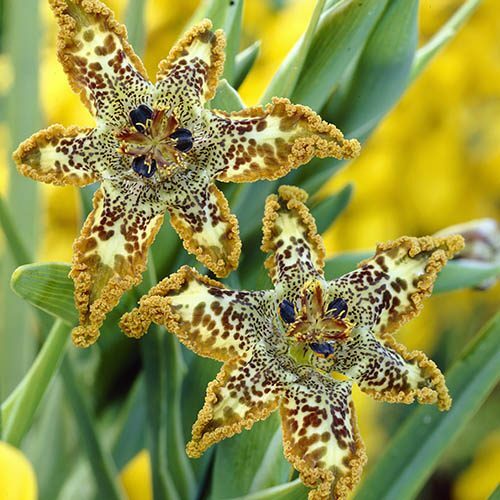 Bulbs will multiply from year to year so you'll soon have a plentiful crop of this rare beauty! Supplied as two corms ready to be potted. This strange and fascinating member of the Iris family looks as though it would be at home in an aquarium! Growing from a small corm, flesh sword like leaves appear in early summer followed by the intricately beautiful fragrant flowers borne on 40cm stems. As a half hardy plant Ferraria is best grown in a pot - it like good drainage so mix 30% coarse sand with your compost. Flowers appear in spring and early summer after which the pot can be left to dry as bulbs become dormant. At the end of summer lift and replant - you'll find the bulbs multiply from year to year so you'll soon have a plentiful crop of this rare beauty!